Eclipsing blockbuster military shooters on a fraction of the budget. What is it? Multiplayer manshooting with a focus on realism. I’ll never forget the screaming. We'd just locked down checkpoint C, a three-storey townhouse in a wartorn village, and the six of us had taken up positions guarding all windows and entry points, waiting for the counterattack. First a pregnant silence, then a racket of assault rifle bullets and panicked shouts. We were repelling them. The timer had almost expired. 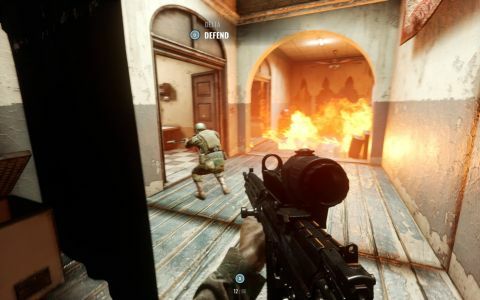 Then a squadmate threw a speculative incendiary grenade at a doorway, and the screaming started. The area was being contested, and the insurgent contesting it had just been set alight. The round ended with six of us watching in mute horror as he crawled, wailing, through the fire, into the hallway where he eventually expired. This unscripted moment from one of Insurgency Sandstorm's eight-player co-op matches against waves of AI forces really does speak of its qualities. Not just of the eerily convincing soundscapes it conjures, full of dialogue and terrifying reverberations, and not just of the inherent tension to its control point-based modes. It also demonstrates an ability to convey the ugliness and horror of modern military combat, without the need for overwrought scripted sequences as with Battlefield and Call of Duty. Not bad for a series that started life as a Half-Life 2 mod. Sandstorm is equally brilliant as a co-op or competitive multiplayer game, offering competent large-scale 16v16 fights with vehicles but really excelling at tighter encounters on chokepoint-heavy maps with fewer combatants. The exact nature of the conflict you're fighting and dying for is non-specific but the reference points span Black Hawk Down to Zero Dark Thirty via The Hurt Locker—in other words, a patchwork of post-millennium war in the Middle East. Among the men in bomb vests sprinting at you and the RPG fire, what stands out in particular is that no one's playing the hero. Instead, every player-controlled and AI soldier sounds terrified. They shout out when they spot an enemy, when they need to reload, or when an objective state has changed, but they never sound like they're relishing the fight like Call of Duty's psychopathic operatives do. They're bricking it, like any sensible person would do. I'd love to see the inner workings of Insurgency: Sandstorm's code so that I could understand how developers New World Interactive manage to trigger appropriate canned dialogue at just the right junctures. That said, they've probably got their hands full, what with this game releasing, so walking an imbecile through their complex systems maybe isn't the most sensible use of their time. Nevertheless, the game's unusually articulate soldiers have plenty of provocation to sound terrified in a given match, treated as they are to very few lulls in the action and bombarded by surprise attacks. Co-op consists of a series of checkpoint captures, in sequence, while AI attack each one in waves. Competitive modes, meanwhile, range from Hardpoint-like power struggles to traditional two or three point control scenarios. There's no attempt to reinvent the wheel that's turned at the centre of modern military online shooters, nor any great imperative to do so. Insurgency: Sandstorm just gets on with doing the fundamentals brilliantly. Weapon behaviour takes a bit of getting used to, mind you. There's no extra layer of visual or sonic feedback for successfully shooting an opponent, so you're sometimes at a loss as to whether your long-range shots connected or not. The active reload mechanic is also sure to catch the new player out at least a dozen times, but these are concessions to realism that Insurgency Sandstorm absolutely convinces you are worth making. Eventually the absence of hit confirmations becomes something to actively enjoy, just like those moments you remember to lean around a corner and hit your mark. Here, more than anywhere except arguably ArmA, you can take tremendous pride in playing like a professional soldier and forgetting about K:D ratios. If nits must be picked, it's the vehicles that stick out for their rough and ready implementation. I've had some great moments in the gunner seat of a converted pickup, true, but the vehicle handling itself and the extent to which map design actually accommodates them just isn't quite there. There's the lightest touch of jankiness reminding you this isn't a triple-A shooter, but it's only with vehicles that you feel the experience actually suffers for it. Even with those creases, I haven't played a multiplayer shooter as exciting as this for ages, and I'll be coaxing friends into its co-op mode for months to come. I'll also try—and occasionally fail—to describe just how good it sounds from moment to moment to anyone who'll listen. See you at checkpoint C.
Update: This review has been updated to reflect the maximum co-op player count of eight, and that bullets do not self-replenish.